OLATHE, Kan. (BRAIN) — Garmin Ltd. on Wednesday reported an 8 percent increase in third-quarter revenue to $810 million, with its marine, aviation, fitness and outdoor segments growing a combined 16 percent compared with a year earlier and contributing 80 percent of total revenue. HELSINKI (BRAIN) — Amer Sports reported net sales increases of 9 percent for its third quarter and 5 percent year-to-date, compared with the same periods last year. The figures don't include Amer's cycling business with the Mavic and Enve brands because Amer now segments cycling as "discontinued operations" as it looks to sell that business. OSAKA, Japan (BRAIN) — Shimano says stable weather in Europe and growth in sales sporty e-bikes helped its bike-related sales grow over the first three quarters this year, while operating income in the segment decreased slightly. The company has revised its full-year forecast down in light of currency exchange trends and some product shortages. Second quarter sales were down from last year, but up from the first quarter as net losses outperform estimates. SAN MATEO, Calif. (BRAIN) — GoPro, Inc. announced second quarter sales of $283 million, down 5 percent from the same period last year, but up 40 percent compared to Q1. 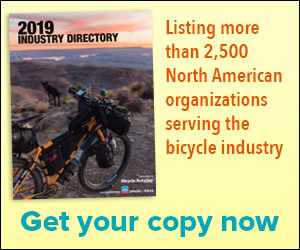 The company — which claims it holds a 97 percent share by dollar in the U.S.
MONTRÉAL (BRAIN) — Dorel Industries said Friday that its bike business rebounded in the second quarter with revenue up $15.5 million or 7.4 percent to $224.5 million. SCOTTS VALLEY, Calif. (BRAIN) — Fox Factory, which offers Fox suspension, Marzocchi, Easton cycling and Race Face products in the cycling market, saw a 15.1 percent increase in sales of bike products in the second quarter. OLATHE, Kan. (BRAIN) — Garmin saw a 24 percent increase in sales in its fitness division (which includes its bike products) in the second quarter this year, and has seen a 23 percent increase year to date. HELSINKI (BRAIN) — Amer Sports, owner of Enve and Mavic, reported Thursday that sales in its cycling division were down 13 percent in the first half of 2018, to 60 million euros ($70 million). In the second quarter, sales in the division were down 11 percent. TAICHUNG, Taiwan (BRAIN) — Giant Manufacturing's first-quarter earnings report offers a look at how the e-bike market is changing the look of the bicycle industry. Premium e-bike sales drove Giant's growth in the first quarter, accounting for more than 30 percent of its quarterly revenue.